Dehydration occurs when fluid output is greater than fluid input. Infants and children are at greater risk of developing dehydration than adults due to higher metabolic rates, inability to communicate thirst or self-hydrate effectively and greater water requirements per unit of weight (1,2). To add to this, many common conditions in younger age groups can result in dehydration. This results in dehydration being a common presentation for children and infants in both primary and secondary care. It is important to be able to assess for and effectively manage dehydration as failure to do so may result in severe complications including electrolyte imbalances and end organ failure from hypovolaemic shock. It is useful to think of the causes of dehydration as falling under one of two categories. Structural malformation – e.g. tongue tie, cleft lip and/or palate, micrognathism. These will most likely be picked up and managed during the neonatal period. Discomfort – e.g. oral ulcers, tonsillitis, viral pharyngitis, stomatitis. Respiratory distress – In order to feed and drink, it must be possible to temporarily stop breathing. This is very difficult if already short of breath. Neglect – Though uncommon and rarely deliberate, poor fluid intake may result from inadequate feeding in neonates and infants and poor education or supervision in children. Diarrhoea and/or vomiting – The most common cause of dehydration in children in the UK and worldwide (2). Can present in a variety of common paediatric conditions such as gastritis, gastroenteritis, pyloric stenosis, mesenteric adenitis, acute appendicitis and diabetic ketoacidosis. Excessive sweating – e.g. strenuous or prolonged physical activity, hot weather, pyrexia. Is the patient still eating and drinking? If so how much? Along with asking about fluid losses, this will give a rough estimate of the current fluid status of the patient. Is the patient still urinating? If so are they passing the same quantity urine and as often as when they are healthy? Is the urine concentrated or diluted? Polyuria may cause dehydration and give a clue to the underlying cause e.g. diabetes mellitus type 1, diabetes insipidus, adrenal insufficiency. Oliguria or anuria could have many causes, one of which is severe dehydration. NICE have produced the following guidelines for assessing dehydration and shock (4). 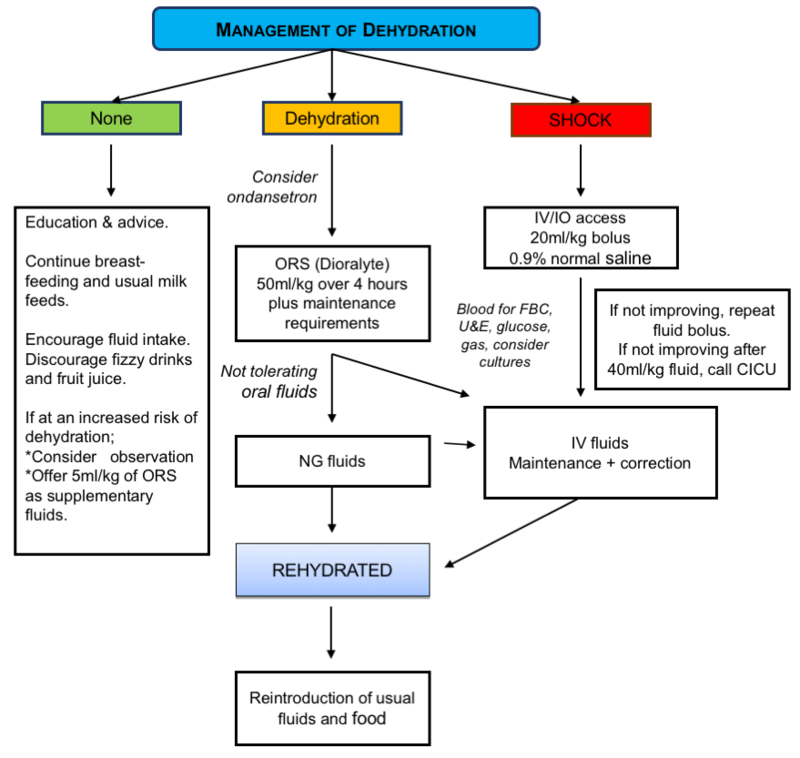 Figure 1 provides an overview for assessing and managing dehydration. Any reversible causes of dehydration should be investigated and managed to prevent further fluid losses. Depending on the clinical picture, rehydration will be achieved via oral rehydration solution or IV fluids. All patients should have fluid balance charts to assess fluid input, ongoing losses and urine output. Oral rehydration solution should be given in small volumes at frequent intervals. Regular reassessment will be required to determine its effectiveness. If a child is clinically dehydrated but able to tolerate enteral fluids (PO/NG) then a 50mL/kg fluid deficit is calculated. This is given orally, along with maintenance fluids, over 4 hours as oral rehydration solution. For example, a child who weighs 10kg will require 500mL AND maintenance fluid over 4 hours. A child persistently vomits the oral rehydration solution, given orally or via a nasogastric tube. If inadequate or no response, give another rapid 20ml/kg sodium chloride bolus and consider other causes of shock. In a child who is not in shock, yet requires IV fluids, deficit correction should be achieved as follows (note: there are varied methods for calculating fluid deficit and so this information should serve as a guide for learning. Use up to date national guidance in your area or hospital for patient management). If there is a recent weight done prior to admission, the fluid deficit can be taken as the weight loss compared to current weight. For example, if weight done 2 days ago was 15.5 kg and current weight is 15 kg, the fluid deficit can be taken as 500 ml (500 gram lost = 500 ml lost). However, if there are signs of clinical dehydration, and there is no recent weight, the fluid deficit is calculated as: weight (kg) x % replacement x 10. This is given over 48 hours. The % replacement (also known as % dehydration) should be assumed to be 10%, if dehydrated. For example, a child who weighs 12 kg will require 1200 ml (12 x 10 x 10) over 48 hours, or 600 ml each day in addition to their maintenance. U+Es and plasma glucose should be measured before starting deficit correction and regularly over the 48 hour period. Electrolyte imbalances and/or hypoglycaemia may require alterations to the type of fluid used. Significant ongoing losses through, for example, vomiting or diarrhoea should be documented on the patient’s fluid balance chart and replaced in addition to fluid deficit correction. In a patient with hypernatraemic dehydration, call for senior paediatric help. Fluid will need to be replaced slowly over 48 hours in order to avoid cerebral oedema. Regular monitoring of U+Es should be done to ensure plasma sodium does not fall by a rate greater than 0.5mmol/L/hour. Parents should be given the advice outlined in ‘Fluid management after Rehydration’ following any treatment for dehydration. Total 1600ml over 24 hours (1600/24: rate = 67ml/hr). Remember to monitor electrolytes to determine if anything such as potassium should be added to the fluids. Note: Over 24 hours, males rarely need more than 2500mL and females rarely need more than 2000mL (5). What is the most common cause of dehydration in children? Which of these is a red flag sign for assessing dehydration and shock? What bolus do you normally give to a child with shock? Which of these is a symptom of hypernatraemic dehydration? How much maintenance fluid do you give for the first 10kg of body weight?